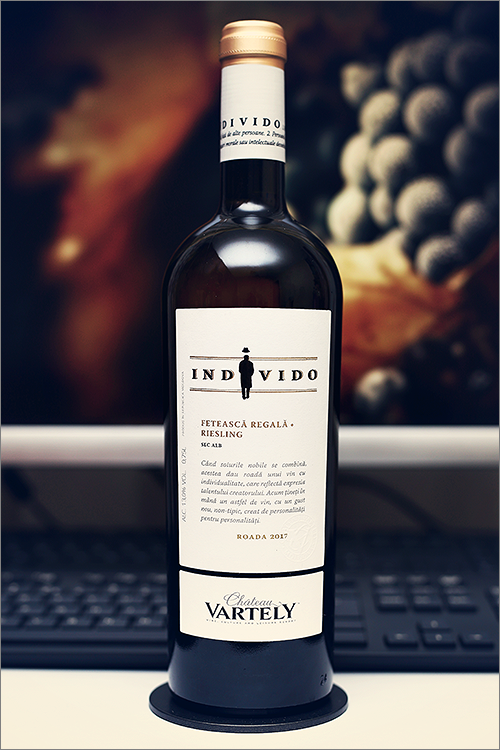 Today we are going to review yet another white wine blend that is neither new nor old, one that is still relatively unnoticed by the wine lovers – Individo Feteasca Regala – Riesling 2017 from Château Vartely. This wine is a blend of two grape varieties that have incredibly appealing aromas: feteasca regala, which is responsible for the subtle aromas of wildflowers, and riesling, which forms the body and structure of the blend, allowing the wine to achieve elegance and finesse. This wine is also part of the Individo wine series, that is a set of 6 wines, each with its own personality and character – wines that seeks to satisfy the thirst for individuality. That said, let’s get straight to the tasting! Bright and elegant yellow color with pale green shades towards the rim of the glass. The nose is strong, filled mostly with floral flavours and sweet fruits: peach, lemon, nectarine, ripe apricot, honeysuckle, elderflower, ripe yellow apple, jasmine, overripe quince, melissa, hay, fresh cut grass, margarette, straw grass and some nuanced notes of honey. The wine is dry, with high alcohol level, moderate acidity and rough tannin. It tastes green, floral and lean, a bit rough and quite herbal. This is an angular, oily and a bit sharp wine, with a touch of alcoholic warmth showing through, which makes it a bit off the balance. Towards the end of the palate the wine feels supple, populent and fruity. It has a medium-plus finish and an angular, green and a bit rough aftertaste. Conclusion: this wine is either in its prime form or a just couple of months away from it. We do recommend to drink it now and not waste the time and effort of bottle ageing. This is a wine that lacks structure and character, as neither feteasca regala nor the riesling are able to provide the required body strength. In order to amplify the wine’s aromatics, we would recommend to pair this wine with slightly spiced or creamy dishes, like for example an oven roasted garlic and butter rainbow trout or some four cheese spaghetti with white butter sauce, as the creaminess in the dish will counter-balance those sharp and rough edges of the wine. It’s all about the balance. Cheers!